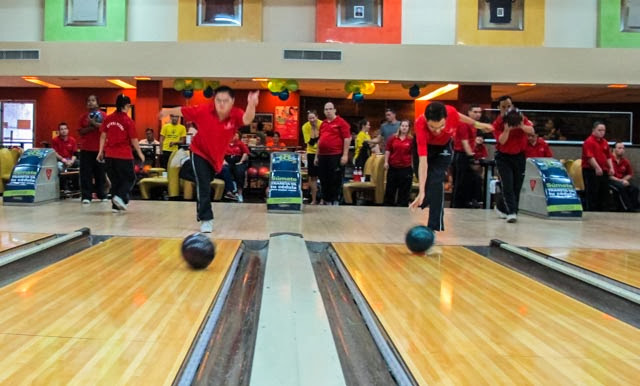 We never really thought we'd spend a weekend bowling in Panama City, Panama. Never say never. We were resting up after our daily afternoon stroll between the fish market and Casco Viejo, when we heard two people talking animatedly about an upcoming sporting event. We soon figured out they were discussing a bowling tournament, of all things. Interest piqued (Kip's a closet bowler, for real), we leaned in closer and soon learned that the Panama Special Olympics would soon be hosting its national bowling championships. Yes, we introduced ourselves immediately. Then, of course, we asked if they could use some free help at the tourney. Lucky for us, the two were helping organize the event, and soon enough, we were signed on as "voluntarios" for the big games. As volunteers, we would be doing everything from serving as guides for the participants to keeping order during the games, coordinating scores, and generally doing whatever anyone deemed necessary during the event. 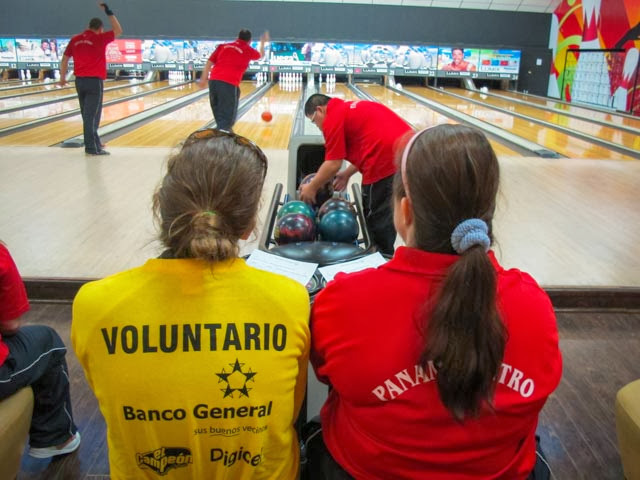 Working at a bowling tournament may not seem like the funnest way to spend a weekend in Panama. But think about it -- when would you ever get to sit front row at a national championship of anything, AND get to hang out, slap high fives and generally just have a good time? And do it in Central America with the amazing athletes from Special Olympics? Yeah, we had the best time ever. That's us below in the center, hanging with 'our' team just behind us and getting a hug from Pedro. Between frames we got to talk with the athletes. They told us about all the work they'd done to get where they were. They taught us how to say "strike" and "turkey" in Spanish. One girl told Liz she was going on a date with a guy from an opposing team, but that we couldn't tell anyone or her teammates would get really mad. 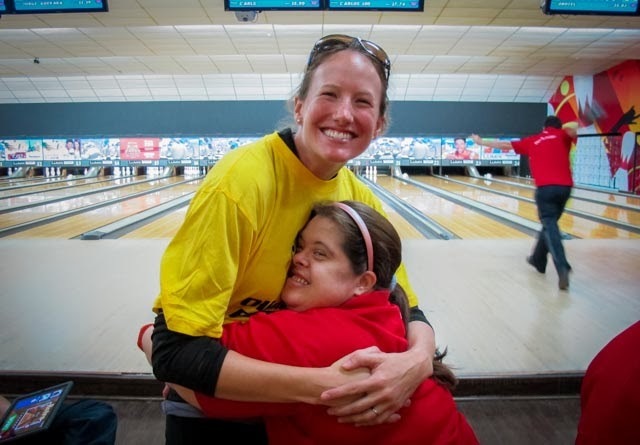 We learned a lot that day -- both about bowling and about life as a Special Olympian. As the bowlers rolled their final frames and the medal ceremonies ended, we realized we had been a part of something very special indeed. 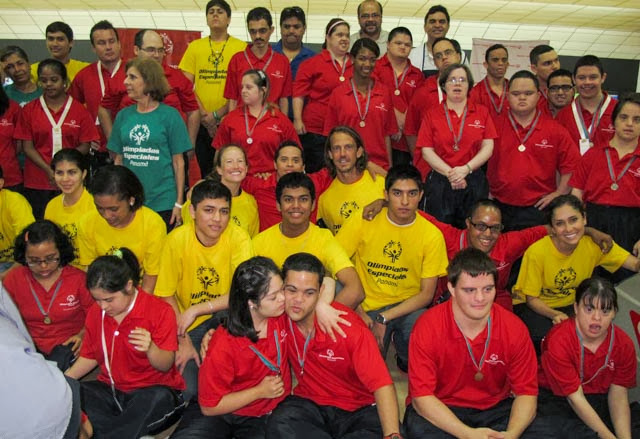 And we owed it all to volunteering and to the amazing athletes and people we met with Special Olympics Panama.